The safety key for treadmills is an essential component for safety that the overwhelming majority of modern motorized treadmills use. It works similarly to the safety key on a water bike or other equipment where the user can fall. The key allows the treadmill to operate, normally one end is connected to the tool, the other is connected to the user. If the key is unplugged, the treadmill detects that there may have been an accident and activates the treadmill safety function that immediately stops the belt. Different brands of treadmills require a specific size and shape of the key, although the key basic function is the same. Most treadmill keys stick to the user's clothing, but some may have a bracelet that can be worn on the wrist. The treadmill requires constant contact with the key to continue working and if the key is removed, the treadmill immediately stops the movement and shuts off to avoid hurting the user if he stumbled and fell off the belt. Also, it may be useful to remove the key if there are children who could inadvertently start the treadmill and put themselves in danger. The way the key connects to the treadmill may vary depending on the brand and model. Some have the shape of a small thin card that is inserted into a slit on the treadmill and by simply pressing the "power" or "start" button, turns on the treadmill and allows the belt to start. 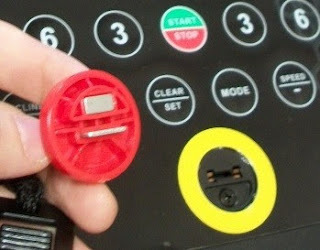 Other brands and models use a magnetic key, which is easier to pull off the magnetic pad on the treadmill interface and is more sensitive to movements, including accidental falls, which pull the cable to the side. With this type it is easier to accidentally touch the pad magnet by interrupting the workout, but the user is more protected from possible injuries if he falls to the side of the treadmill. It is also less likely that it breaks down and needs to be replaced less frequently than the classic type. Unfortunately, many users do not feel the need to wear the treadmill key because they find it uncomfortable to tie around the wrist, hang it in a pocket or sleeve. But if the user falls without wearing it, there will be no signal to stop the engine of the treadmill, and the belt will continue to move. This can be dangerous if a foot, other parts of the body, or a piece of clothing are stuck in the running belt or under the appliance. In addition, stumbling and falling when the belt moves at high speeds can cause the user to fall backwards by colliding with a wall or anything behind the treadmill.